← This is how we dance. Remember in college when you didn’t actually need sleep or nutrition, or at least, you willed your body into acting like it didn’t? You would pull all-nighters (ok, not me because I just give up around midnight), eat nothing but cereal for weeks on end, inject lots of caffeine, and still be fine when it was all said and done. What. Has. Happened. To. Us? October has just about done James and I in. Job stress, school stress, awesome wedding fun, trips out of town, visitors, and the daily things that have to be done have amounted to an amazing cocktail of good and bad that left us stumbling towards November in a dazed state of exhaustion and indigestion. Despite what my Instagram feed makes it look like, we actually eat generally healthy meals, or at least we did until this month when busyness had us throwing back burgers at an even more alarming rate than usual and letting fresh produce wilt forlornly in the fridge. We counted the peppers on pizza as vegetables and a couple times, I think there was even a time where we ate the three awesome meals of breakfast, brunch, and brinner all on the same day. And now… now I just want to crawl into a giant cave of kale and let it sink into my soul via osmosis until I can think clearly again. Which is convenient, as kale has a ridiculously long growing season and keeps on showing up in my weekly box so that I am forced to get creative. Kale chips, we do not do. Yuck. I tried once, really I did, but they were a sad, sad imitation of their salt and vinegar coated likable cousin the potato chip and I just can’t do it. James is an avowed kale hater, but he will pack away this baked lemon chicken and kale dish (can I get an AMEN for one dish dinners, all ye kindred spirits without dish washers???) and he even moderately enjoyed this kale-potato-sausage soup, though he did suggest improving it by substituting bow-tie pasta in for the kale. Last week, to stave off the scurvy (is that still a thing?) that I was sure was setting in, I pulled odds and ends out of the fridge and came up with this kale salad that is so good you will almost forget it is healthy. James, of course, won’t touch it since it has raw kale, and goat cheese (he only does cow lactate… if you ask him why you will get a really long and disgusting story about goat farms), but I really don’t mind because then there is more for me! Toss sweet potatoes in olive oil, salt and pepper and roast at 400 until tender, 20-30 minutes, turning half way through. Let cool slightly. Mix 3 Tbs olive oil, lemon juice, vinegar, syrup, mustard powder, and dash of salt and pepper and pour over kale. Massage the dressing into leaves until the leaves are tender and diminished in volume substantially. Slice apple into very thin wedges and toss apple slices, and some almonds (I go real heavy on them, but it is up to you) in with the kale. 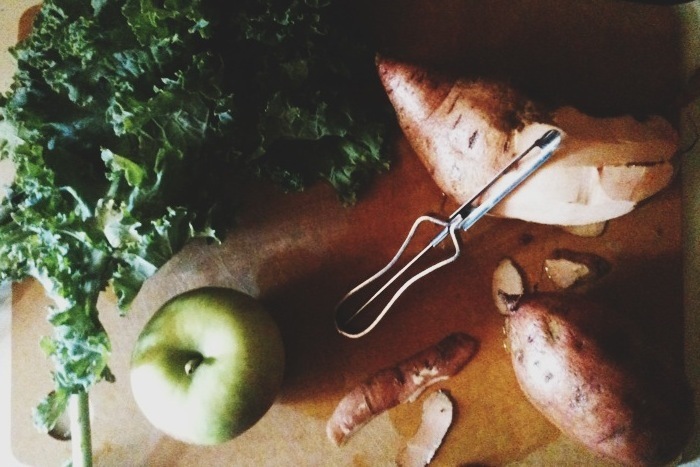 Add sweet potato chunks and toss to coat. Sprinkle with goat cheese and serve warm. Ok all, any other awesome kale ideas? Please share! This entry was posted in Uncategorized and tagged cheese, food, vegetables. Bookmark the permalink. So right after reading this I got a tahini kale salad at the semi-shady food co-op on campus and it was pretty terrible. However I will withhold true judgement until making yours… or getting it at Whole Foods. I trust your foodie judgement. I’ve recently really enjoyed blended soup; since Alex’s opinion of kale is similar to James’ (though not quite as extreme), he hasn’t known it was in there. 🙂 We’ve done kale in a vegetable soup, butternut squash soup, chicken soup…I just blend it all. When you massage it the kale gets all wilted and soft! Awesome. Thank you for that tip. I shall try raw kale very soon then! I hear you loud and clear! 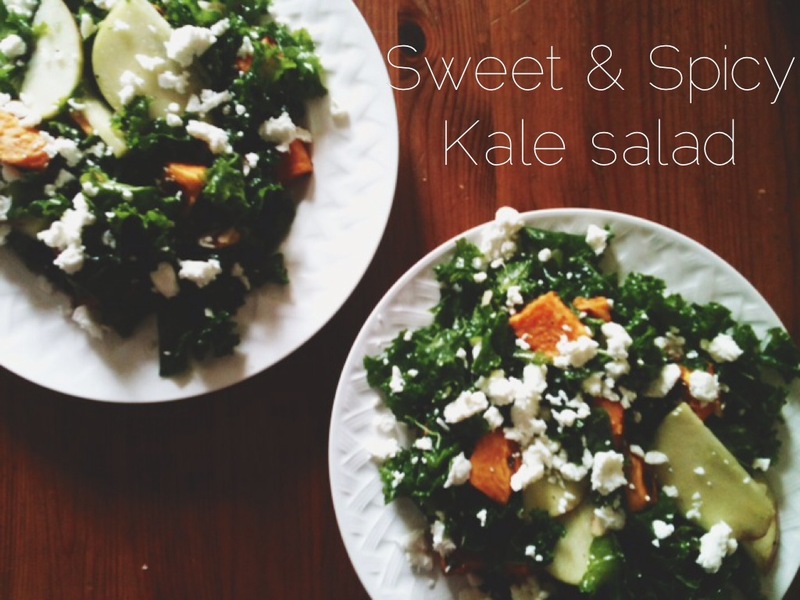 After my husband and I accidentally ate pizza TWICE in one day, we were in need of kale… and more kale. 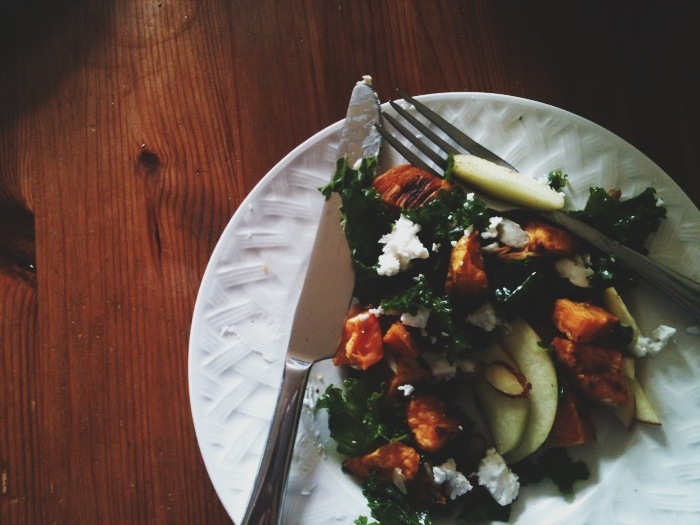 Thanks for the yummy salad recipe – dinner last night, and leftovers for lunch. Thanks for all you do and share! Glad you liked it! And hooray for leftovers and not having to pack lunches!!! Scurvy is actually still “a thing,” though it isn’t as common now. It results from a Vitamin C deficiency, and is now seen mostly in older adults suffering from malnutrition. Yum! My husband tried a delish kale and pear salad at Founding Fathers that was amazing and he’s not much of a kale fan 🙂 We had a wonderful trip with all your awesome recommendations btw! I can’t remember if I thanked you, if not ~ thank you! I’m so glad you liked it! And now I feel inspired to throw some pears in the mix! I have never heard the term brinner for the time of eating after lunch but before dinner! I love it! My family uses the terms lunch and supper to make lupper. Brinner is actually Breakfast for Dinner and it is AWESOME. Though lupper does sound pretty good too!